The last quarter of the year is upon us, and for many people, it means that tax season is looming large. It's time to wrap up finances, itemize your deductions and get ready for the uncertainty of April. For us in the solar industry, every season is tax season. Why? Investing in solar gives you the opportunity to leverage your tax burden to get the biggest refund of your life. We work to get these credits back in our customer's hands all year round but to claim those credits next year; you need to invest in a solar system before the end of 2018. 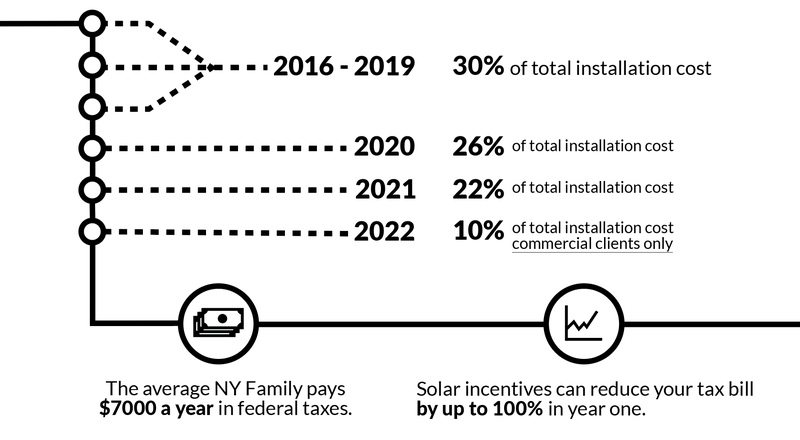 To help people understand all the solar tax credits available, we've been writing articles every few weeks to help NY residents understand every tax credit and grant available. We saved the most significant solar credit for last; the Federal Tax Credit. the cost of a solar energy system from your federal tax bill. The ITC applies to systems for homes or businesses, and there is no upper limit on its value. credits come April. For some, that can be as much as an 800% increase in their refund. The Energy Policy Act of 2005 led to the creation of the Federal ITC and was set to expire at the end of 2007. A series of extensions pushed the expiration date back to the end of 2016, but experts believed that an additional five-year expansion would bring the solar industry reach its full potential. Thanks to the spending bill passed by Congress in late December 2015, the tax credit is now available to homeowners through 2021.
tax credit wipes out 70%+ of the average families tax bill. That's a massive amount of savings. The Federal tax credit is an essential ally in the mission of owning your energy and reducing your tax burden. A partner like Renovus can work with your accountant to make sure you get every penny available to you and save as much as possible. If you want to cash in on the thousands of dollars in tax credits and grants that can give you the largest refund of your life, time is ticking! Due to the high demand, and the short amount of time available, Renovus is cutting off all residential installations on October 21st, 2018. If you're interested in going solar and saving thousands in 2019, the time is now! ​Interested in going sol​ar this year? There's never been a better time. Panel prices are at all time lows, and incentive packages are at all time highs. What does that mean for you? Saving thousands on energy bills. Learn more by clicking the button below!